Good thrashing metal. This is what the UK scene has been missing on the ground level and Derision have risen to fill that hole. 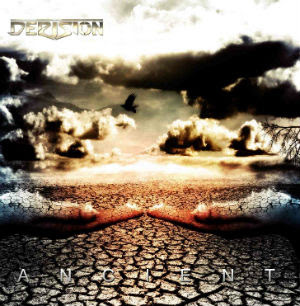 Ancient is a prime example of some good 80’s metal thrashing with some modernised vocals sitting on top of the riffs, with the standard thrash metal double bass flowing seamlessly underneath. The riffs are powerful and will toughen up your neck muscles as you headbang your way through the entire album without missing a beat. I found myself unconsciously nodding along to the songs as I was listening to them. The solo’s pack a kick as well, being fast and dramatic without being pretentious, a rare feat in metal. There are a few niggles however, and whilst it doesn’t particularly tear away from the pleasurable listening, it does get a grating after a while, and that is that there is such little variance in the vocal styles so therefore it gets just a little boring hearing the same style of vocals over and over again with no difference between them. As I say, it doesn’t detract from the listening off the album, but it does get a little grating. Overall a good effort from Derision, and I will definitely be checking out what they are doing in the future.